DC Sail's beginner sailing course ensures that with practice you will learn the basics of the sport of sailing. We want you to not only learn how to sail but also to continue building your skills. DC Sail is dedicated to making your unique experience something that will last a lifetime. Membership Benefits and Boat Rental Policies can be found by clicking here. 4 days of instruction (12 hours total). A 12-month membership to DC Sail (required) which provides access to all of our programs and allows for plenty of sailing practice. US Sailing Small Boat Sailing Certification (nationally recognized). Ample opportunities to practice your skills on weeknights by attending Members Only and Social Sails. Sailing is a complex sport and requires many hours on the water with opportunities to learn something new every time you leave the docks. Includes a "Start Sailing Right!" textbook & the US Sailing Red Log Book. Instruction takes place in 19-foot Flying Scot sailboats. 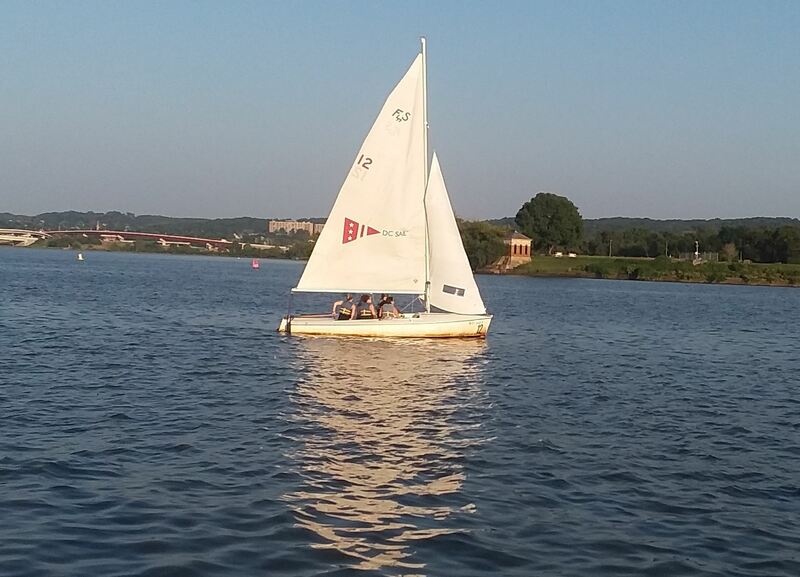 DC Sail follows the the US Sailing Small Boat Curriculum. US Sailing is the governing body of the sport of sailing in the United States. This certification ensures that you are receiving the best quality of sailing education. See below for more information related to Curriculum, Prepare to Sail, Guarantee Policy and Certification Information. Included in the course fee, students will receive a copy of US Sailing's acclaimed Start Sailing Right! textbook and a US Sailing Small Boat Certification Red Book. Wear something you don't mind getting a little dirty and possibly wet and consider what the weather is going to be both in terms of temperature and wind speed. It tends to be a bit cooler on the water than on land (that's why sailing is a great summer activity). Shoes - tennis sneakers or shoes designed for sailing have the best traction, but any sneaker of some sort will suffice (the softer the sole the better). You must wear closed-toe shoes or sports sandals (choco's or teva's). Flip-flops and open back shoes are not permitted. Top - a t-shirt will often do the job, but if it's windy or rainy, a light fleece top, sweatshirt, rain-jacket or some combination will meet your needs. Bottom - shorts or pants depending on the temperature. Rain gear - If rain is forecast, please bring rain gear. We will evaluate weather conditions at the dock and will sail in the rain if there no severe weather is in the area. We do not cancel lessons due to rain. DC Sail's programs and dock remain open when it is raining. However, we will close operations if there is a serious threat of lightning or if the wind speed exceeds 15 miles per hour. If severe weather prevents us from holding the lessons, we will work with you to schedule a make-up lesson. If you need to reschedule your registration, please do so by phone or email up to four days prior to your lesson time. If you fail to reschedule within this time frame, there is a $75 cancellation fee. Our classes are designed around the US Sailing Small Boat Sailing Certification, and most students should be ready to pass the US Sailing Small Boat Sailing Certification test after completion of our four classes. Many of our students also take advantage of our Member Sails on Monday evenings and Social Sails on Wednesday evenings to get a little practice in during these fairly laid-back events before (and after) their check-out sails which occur during your first Flying Scot Rental. For Boat Rental Policies, please click here. Additional certification is required by the District of Columbia prior to any Boat Rental. Please call or email us. Email to Traci Mead, Director of Business Operations or call (202) 547-1250.